EAA AirVenture Oshkosh West Ramp Rats moving Aircraft at the fly-in. Priceless Aviation sponsors tugs and ground support equipment. Priceless Aviation has been manufacturing Ground Support Equipment and Aircraft Tugs since 1998. We are situated in Lawrenceville, Georgia, USA, in a facility comprised of factory and office space totaling 216,000 sq. ft.
We manufacture a complete line of Aircraft Tugs – including electric tugs and gas powered tugs – and supply a large selection of ground support equipment. This includes Ground Power Units, DC Load Banks, the highest quality industrial Aviation Tools, Avionics Tool Kits and tool boxes, Scope Inspection Cameras and more. We have been a proud Partner with EAA AirVenture for many years. Any pilot who flies into the event will recognize our yellow Priceless Tugs® used to maneuver aircraft around the tarmac. Our tugs receive rave reviews from the West Ramp Rats ground support crew and pilots arriving and departing the event. Priceless Aviation is a division of Atlanta Attachment Company. Continuous ground power units 25 amps to 600 amps start units up to 7000 amps peak. Combination of start and continuous power. Voltages at 24V, 26V, 28V. Battery, mains, or engine powered. Priceless Tugs® range of aircraft tugs are designed to move aircraft of all sizes with ease. 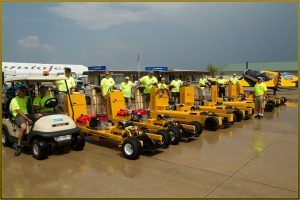 Electric tugs and gas powered tug options are available as part of our ground support equipment range. Priceless Aviation offers a selection of pre-designed aviation tool kits and tool boxes that have been designed using the highest quality aviation tools. Bespoke tool control also available. It has always been our policy to make the highest quality systems available to all, dispelling the common misconception that quality inspection systems have to cost the earth. Priceless Aviation provide a range of portable resisted load banks for civil and military aviation, our load banks provide an contained organised and fully controllable load with the highest quality components. The Priceless Aviation Frequency Converter product range offers both static and portable solid state units. The Red Box range of battery, aircraft start units are the ideal solution for starting the majority of DC aircraft. Atlanta Attachment is the headquarters and production facility of Priceless Aviation’s ground support equipment and products. Please contact us for all queries regarding our aircraft tugs, tool boxes and tool kits, ground support equipment, ground power units, aircraft GPU and any of our other fantastic products and we will get back to you as soon as possible.